Verkadefabriek, Hertogenbosch The Luka Bloom documentary was shot last year in Ireland (2005). We interviewed Luka at his house in Newbridge and filmed performances in his music room at home, his sister's house and The Doolin Cafe in Doolin, and there is also a large role for Luka's sister Anne Rynne. Irish singer-songwriter Luka Bloom has turned 50 recently. With their intimate portrait 'My Name Is Luka' director Helmut Boeijen, cameraman/editor Tim Klok and sound engineer Menno van den Berg, draw up the balance sheet of half a century Luka Bloom. In this personal documentary the younger brother of Christy Moore, the most popular living Irish artist, traces his own roots and visits people and places that have formed his own life and contemporary Irish music in general. 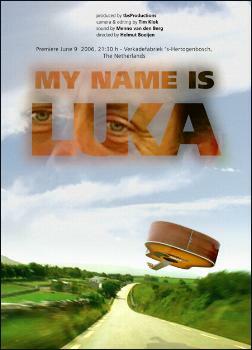 'My Name Is Luka' has already been bought by the Belgian public broadcast company VRT and the Australian ABC. Negotiations with other television channels are still running. The documentary has also been selected for the Indie Can Film Festival in Toronto (CA) and will also be shown on Luka Bloom's Live-DVD. "Solitude is the most important ingredient for me in writing songs. I think, it has to be ok to be alone for a long time to write songs." Talking about the difficult time when he was ill and not able to work for a long time. but there was a good reason for it - because I needed to change..."
no paper. I just wrote this little song..."
Anne showing her office - calling it her "packing room" - and talking about her job, "selling her brothers' CDs and being part of their work"
Luka talking about becoming "Luka Bloom"
"...it's just a brand name, a nick name..."
Talking about "being alone" and "being on the outside"
I hope some of that is reflected in my songs..."
and to feel comfortable here. I've brought my songs home..."
And we must go a marching to the beating of a drum. I'll take you to the wars me love in High Germany. And out of merry England pass many the man likewise. And sent them to the wars me love in High Germany. I'll think of lovely Willie in High Germany. The Ceili Bandits and Luka playing a traditional tune at the Magnetic Music Café in Doolin. Talking about finishing school, doing his first trip to Doolin in 1973 - "for me, it was like arriving in a foreign country!" - and hearing the Russell brothers, Micho, Packie, and Gussie, playing the old Irish music at O'Connor's Pub. I don't know where I'm going..."
feeling, I have a sense of something, but I have no idea how I want it to finish." in the world as the honey. So I don't always have a romantic view of the world. lasts for 3, 4, 5 minutes, but it might take me a month to complete that journey." Talking about writing the song "The Man is Alive", and bringing it home to his family. the world or of a fraction of their life, I definitely want to do that, definitely!"